Genuine Muonionalusta Meteorite from the border between Sweden and Finland. Comes with Certificate of Authenticity. First found in 1906 but believed to have fallen 1 million years+ ago. Face of cuff link shows the Widmanstatten pattern - unique figures of long nickel-iron crystals found in the octahedrite iron meteorites. 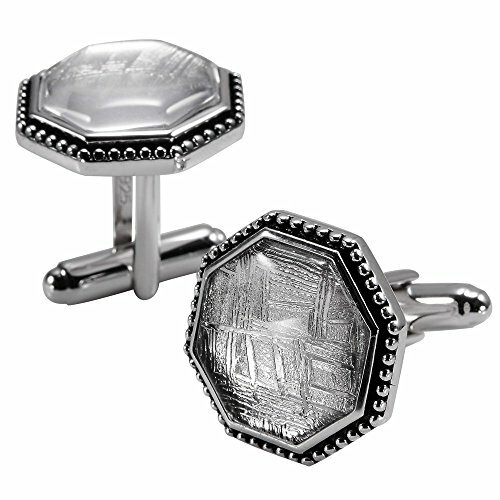 Each cuff link face has durable quartz glass top layer for protection of the meteorite from elements and moisture. Sterling Silver setting. Comes in gift box. If you have any questions about this product by Starborn, contact us by completing and submitting the form below. If you are looking for a specif part number, please include it with your message.